Auditions for Unwell, a Midwestern Gothic Mystery: a new audio drama serial from HartLife NFP. HartLife NFP, the creators of the audio drama serial Our Fair City, will be holding auditions for their new flagship show Unwell on Sunday, February 18th and Saturday, February 24th, from 11am until 5pm. We are currently seeking voice actors of all ethnicities (especially people of color) and genders (especially trans people). Some roles have specified genders, races, cultural backgrounds, or sexualities and some do not. We are committed to creating a diverse cast of talented actors and rewrites will be done with the final cast in mind. Auditions will be held at HartLife Studios- 1934 N Campbell, Chicago IL, and will be short on-mic readings of sides, to be provided before auditions. To set up an 15 minute audition slot, please send an email with resume attached to [email protected]. Click here for more information on the project, roles and auditions. Tickets on Sale for the Our Fair City Season Eight Launch Party! We are incredibly excited to announce that the launch of Season Eight of Our Fair City will take place on August 12, 2017! We will be kicking off the season in style at the Preston Bradley Center’s Mason Hall in Chicago, where the HartLife Board invites you to join them for the 453rd Fiscal Cycle Gala, supporting and celebrating the loving Company that keeps the Cold and Wolves of the Frozen Tundra at bay. All proceeds got to support the good works of the HartLife Company, including the creation of the Eighth and Final Season of the HartLife Historical Records, also known as Our Fair City. Festivities will include an appearance by emissaries of the Board of Directors, complimentary themed food and VIP refreshments, music by DJ Catnip, lighting by Bri Johnson, environmental design by Makena Levine, video content by Sam Kohlhass and much more! Appropriate corporate attire or post-apocalyptic costuming is welcome, but not required. Tickets are $30 in advance, $40 on the day/at the door. Online ticket sales end at 5:00 PM on August 12, 2017. 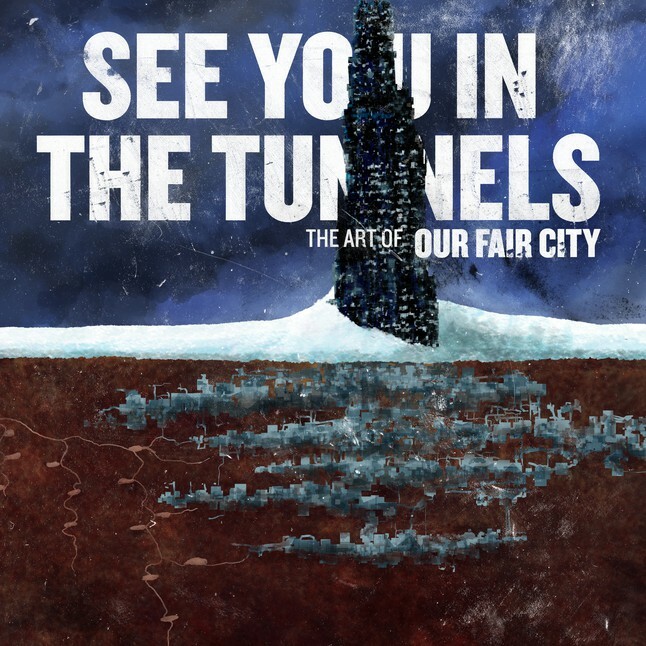 All profits from the party go directly towards supporting the production of Our Fair City. 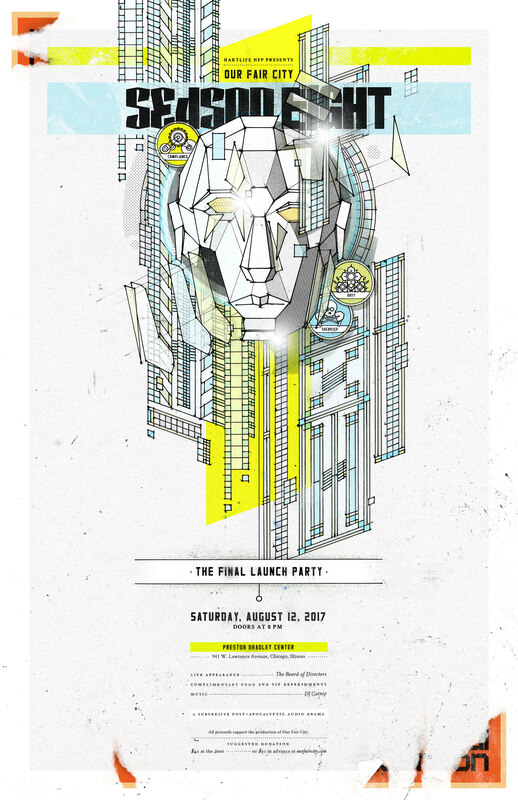 Save the Date for the Season Eight Launch Party! Check back here for tickets and more information soon! We are incredibly excited to announce a brand new member of the HartLife NFP team- Managing Director Eleanor Hyde! As HartLife founder and creator Clayton Faits steps back to continue his work in Law School, we are thrilled to have Eleanor joining Executive Producer Jeffrey Gardner in leading the HartLife NFP team. She brings an incredible energy and fantastic new ideas to the company- we’re all so excited to have her on board. 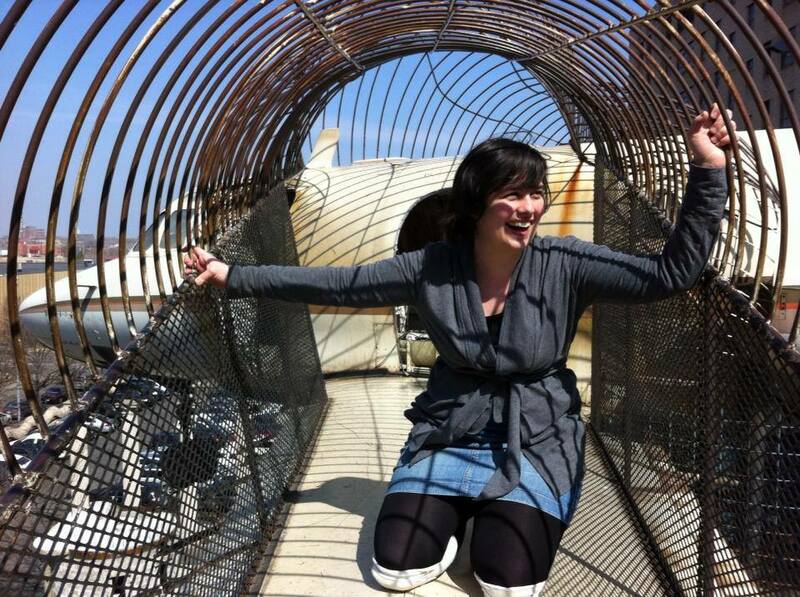 Eleanor is a nonprofit professional, game designer, and storyteller, who has worked with Rabbit Hole, Chicago Shakespeare Theatre, New Leaf Theatre, Emerald City Theatre, and Firefly Partners, a nonprofit digital strategy agency, among others. She holds an MFA in Arts Leadership and Administration from DePaul University, and a BA from Sarah Lawrence College. We’d like to take a moment to speak to all of you as People, not Policies. We, like many of you, have spent a lot of time in the last few weeks grieving the results of the 2016 election, fearing what this means for the future, and figuring out what to do next. Our Fair City is set in a world ravaged by climate change. We are beginning to see the very real effects of a changing climate on our world, and the new President-Elect seems very unlikely to take action to curtail its advance. We are in danger of a worst-case climate change scenario- one that our grandchildren, children, or even we ourselves may not survive. HartLife NFP believes that action on climate change, whether our President-Elect believes in it or not, is vital, and we will continue to advocate and educate about it. Our Fair City is made by artists who are queer, straight, trans, cis, monogamous, non-monogamous, neurodivergent, neurotypical, male, female, non-binary, people of color, and more. We strongly believe in creating a respectful work space where all of us get to be our best selves; a place where we get to be the people we want to be, and where we remain open to learning about the experiences of others at all times. We try to have this attitude represented in our work, and to acknowledge our mistakes and do better when we fail. We know that our fans are as varied as we are, and we want you to know that you are not alone. You are not forgotten. If the Company in Our Fair City is working properly, there isn’t a lot of divergence in its Policies. It is no mistake that we want to tell the stories of those who march to a different drum, those who disagree, and those who rise to become someone they never expected they could be. We want to tell stories that celebrate the vast differences between us all, and highlight the ways that they can be complementary, not in conflict. In short, be safe. Don’t give up hope. We love you all, and we’re so grateful that you are here with us. I’m very sorry to share that we will be delaying the release of Episode 11 of Our Fair City slightly. Our Fair City Season Seven will resume in two weeks on December 7th- until then, we’ve got something very exciting to share with you. For those who were not able to attend our Season Seven Launch party, we’ve created a video tour of the Montgomery Moro Museum, accompanied, of course, by Ol’ Silty’s audio tour. Thank you for an amazing season launch! We’d like to send out a huge thank you to everyone who joined us in person last Saturday at our Season Seven Launch Party, everyone who attended the fan-run online launch party, and all of you who have jumped in to Season Seven! We also want to send out a HUGE thank you to all of our designers and volunteers for the Our Fair City Season Seven Launch Party. It is a monumental task to design, build and run this party, and all of these people do an ENORMOUS amount of work to make sure the party is great. We would like to particularly call out some of our team from this year. We had amazing and refreshing food designed by Duo Yang and Hillel Wayne (no lie, that balsamic mint watermelon was to die for). Mark Harrison made our originally designed cocktail of “Fermented Brain Juice,” and he did not disappoint. Sonny Tursky, our new Merch Coordinator, took over the merch table, and the time and attention she gave to it really showed. In addition, Jenn Olsen, of the silver tongue, got us an amazing array of raffle items. Between the two of them, our Gift Shoppe was very tempting. Lauren Faits dressed up at the Pageant Queen of the Ants (no seriously, you have to see these photos!) and hosted our live content for those who couldn’t join us in person. Dann Tincher solicited, collected and installed the art for our glorious gallery of Mole People art (no small feat), and Resa Lamont was our ticketing human. Lastly, Lizzie Lovelady took on the thankless task of coordinating our volunteers on the night, and her quick thinking and on the spot help were invaluable in keeping me from loosing my mind. We also had something completely new this year, an audio tour of the museum which really turned in to a whole extra episode that we produced. Makena Levine (writer and Rocky II) , David, Rheinstrom (writer), DJ Catnip (sound design), Sebastian Orr (Ol Silty) and Mark Soloff (Dr. Moro) all put in an inhuman amount of effort to get this done, and I am super proud of the final product! Last, but certainly not least, we would like to thank our team of incredible core designers. These women are all at the top of their game, and it is both a pleasure and an honor to work with them each year. Bri Johnson and DJ Catnip rocked the lighting and sound (respectively) again this year, and the way that they coordinate never ceases to amaze me. You may not know it, but they are subtly adjusting the party experience all evening, and it’s lovely to watch. Additionally, DJ Catnip spent many a sleepless night editing our Museum Tour. Melissa Schlesinger built us a giant Cryo Chamber that Dr. Moro (played by the illustrious Mark Soloff) could inhabit, and watching audience play in it after the performance makes my heart smile. One person really blew us all out of the water this year: Makena Levine. She designed, built and organized the installation of countless bits and bobs for the Legendary Doctor Montgomery Moro’s Memorial House and Museum, from photos of the good doctor with the original mole person, to a Pavlovian “Feed the Mold Exhibit”. Makena wrangled a team of talented artists to do this, but the amount of time and talent that she donated herself is staggering. Makena, we are so lucky to have you with us! An extra special thank you is also owed to all of the companies and individuals who donated items to our raffle and party, including: James Kennedy, Jim McDoniel, Lagunitas, Sideshow Theater Company, Theater Wit, Todd Briscoe, Chicagoland Game, Blue Man Group, 20% Theatre, Bottles and Cans, Chicago Comics, Alley Cat Comics, The Hypocrites, Wildclaw Theater, and The House Theatre! Thank you all so much for your generosity, and for supporting independent audio theatre! So, here’s me as Launch Party Coordinator signing off until next year. Working with all of these people is a real high point for me, and I can’t wait to do it again! 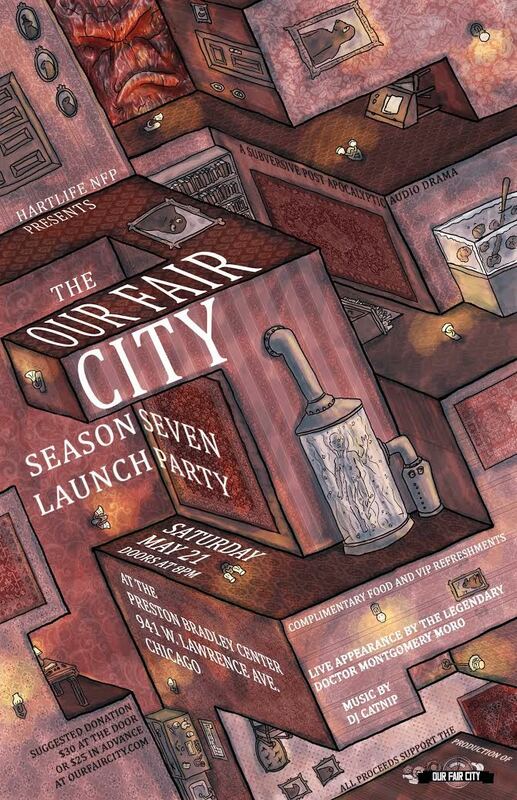 Tickets now on sale for the Our Fair City Season Seven Launch Party! Join us Saturday, May 21 at 8pm at the Preston Bradley Center (941 W Lawrence Ave) for the launch of Season Seven of Our Fair City. Festivities will include an audio tour of the Montgomery Moro Museum and Historical House, as well as a public appearance by the ever-cool man himself, complimentary themed food and VIP refreshments, music by DJ Catnip, lighting by Bri Johnson, environmental design by Melissa Schlessinger, sculpture and interactive design by Makena Levine, and much more! Tickets are $25 in advance, $30 on the day/at the door. Online ticket sales end at 5:00 PM on May 21, 2016. All profits from the party go directly towards supporting the production of Our Fair City.